As the crisis for community care continues, we have heard many valiant stories of those who dedicate their lives to caring for loved ones. The 2016 census revealed the number providing regular unpaid help for a friend or family member increased by 4.4 per cent, standing at 195,263. But what does it feel like to be the one whose everyday needs are in the hands of others, and to watch your loved ones struggle with the burden? In Patricia Sweeney’s home in Clonmel, Tipperary, a photograph, in a silver frame, shows a glamorous woman smiling into the lens, her face full of laughter, as she celebrates her daughter’s graduation. However, in August 2016, Patricia was diagnosed with Motor Neurone Disease (MND). She was just 56. She went from working full-time and being the family organiser, to needing full-time care. In spite of all the difficulties, however, she and her husband Eugene show incredible positivity, explaining that, while life is very different, it is still precious and they are determined to make the most of it. Today, Patricia can no longer walk independently and relies on crutches or a rollator to walk short distances. She needs a wheelchair for anything longer. As the pernicious disease continues, even talking has become difficult. “I struggle to speak and make myself understood where once words flowed effortlessly,” she says. “It’s hard to believe I once made a living through my voice as a teacher for many years. I don’t recognise or like this new voice. Technology is wonderful, but it can never replace the voice you were born with which is such a part of your identity. “People are recognisable by their voice, but I no longer am. I never thought my son and daughter would push me in a wheelchair, or that I would be dependent on my husband for so many things, or that I would have to take early retirement from the job I loved so much. “I would secretly ring my mobile from the landline just to hear my own voice on voicemail. The voice I had taken for granted all my life suddenly sounded beautiful to me and I miss it. Eugene now has to be my voice at times. It is so frustrating and disempowering not to be able to do simple things for myself, like making appointments. “I feel that when people who don’t know me hear me talk with this new slow voice, they think I have an intellectual as well as a physical disability and I find this hard. How can they know I still have a wonderful mind and brain? 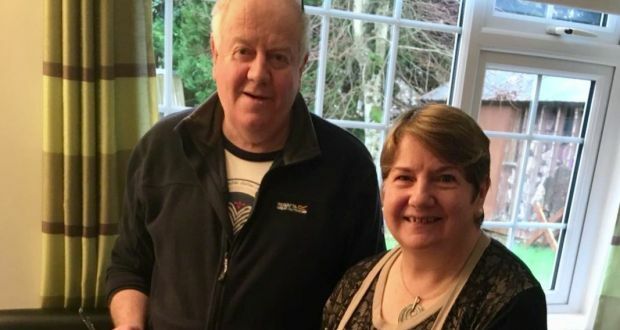 “Initially, as spinal stenosis was found, all my mobility difficulties were put down to this, but when, following surgery, I began to deteriorate further and was then diagnosed with MND, I already needed care. Deep down, I knew my life was entering a new phase of dependency, but even though the neurologist warned me, nothing prepared me for the insidious progressive deterioration and the amount of care I would need or for the enormity that this is forever. “Previously I was a very independent, competent person and I wouldn’t ask for help unless I really needed it and never for the kind of help I need now for the very basics of everyday living. I hate asking for help, but I accept I have to or I couldn’t survive. It’s not easy though. “It feels like a little bit of you dies every time you ask for more help. It’s very humbling and your pride takes a bashing because you feel so disempowered. You feel guilty at the toll it takes on loved ones and how it changes their lives. You feel embarrassed with friends and people you don’t know very well. You feel frustrated and annoyed at yourself and how helpless you have become. “You feel scared of what might lie ahead and what else you will lose the ability to do. You feel very thankful that loved ones and friends genuinely care for you and want to help. Most of all, you wish you could still do these simple things for yourself. “For Eugene, who is my main carer, it has completely changed his life. He has had to give up work and has no income of any kind which has to have a knock-on effect on his self-esteem. The dynamic of our relationship has changed as he not only has to care for me – which is a full-time job in itself – but cook, clean, do the shopping, washing and ironing. I can see the toll it’s taking on his physical health and also the stress he is under because he has very little relief from the endless tasks and very little time for himself.